Ancestry and family life: Nehemiah was the son of Hacaliah. His brother was Hananiah, an important figure in the book. When and where he lived: Nehemiah lived in the capital of the Persian empire. Judah had been in exile in Babylon for seventy years. Under Persian rule they were allowed to return to Judah and many did under Ezra. Many others stayed in Babylon, including Nehemiah. Jerusalem was in a desperate state and lay virtually unprotected. It was an important time for the weak nation to re-establish itself in the area. Training and occupation: Nehemiah was cup-bearer to the Persian king, Artaxerxes. As such, Nehemiah tested the food to make sure it wasn’t poisonous. Nehemiah must have been very well trusted to be elevated to this position. The king trusted him with his very life. Because this position was so important often cup-bearers also became trusted advisors. It was a high position. Later on Nehemiah was appointed the governor of Judah and supervised the rebuilding of the walls. Place in history: Nehemiah helped Judah to reestablish itself at a very critical time when the country was weak and in a dangerous position (see Neh 1:3). He not only led the rebuilding of the walls project, but he also served as spiritual leader for the people and helped bring about a revival. Sensitivity (Neh 1:4) – When Nehemiah heard the news about the state of Jerusalem he wept and mourned for days. He had a very sensitive heart towards God’s people and was filled with compassion. It is not weakness for a guy to be sensitive and compassionate towards others. Nehemiah’s heart was touched with the things of God. Later Nehemiah mentioned that he himself had bought back Jewish slaves and freed them (4:8). Reliance on God (1:4-11, 2:4) – When Nehemiah was faced with the news about Jerusalem he immediately turned to God in fasting and prayer for help. He repented of the sins of Israel and beseeched the Lord to help them in their plight. Notice too, when the king asks Nehemiah what he can do for him Nehemiah first voices a quick prayer to God for wisdom. Ambitious for God (2:5-8) – Nehemiah asks leave from his job to go to Jerusalem and rebuild the temple. He also asks for letters from the king to speed him on his way and give him protection as he goes. However, he doesn’t stop there. He also asked for use of the king’s materials as well! This was extremely bold. Perseverance (4-6) – Nehemiah simply didn’t give up. His enemies tried making fun of the project. The planned an attack against it. He also faced problems from his own countrymen. The nobles had lent money to the commoners and were demanding an interest that these commoners were unable to pay. This caused the commoners to want to give up the work on the wall. Nehemiah 6:1-4. Nehemiah was unwilling to stop the work or be distracted from it. His enemies slandered him and attempted treachery, but nothing would dissuade him or turn him aside form the goal (6:5-15). He even didn’t consider his own life as important compared to the work that God had him do (6:11). Leadership – Nehemiah was a very strong leader. He had a vision for what was to be accomplished. He relied on God. He stuck to the job at hand. He didn’t give heed to lies and gossip which were spread about him. He was courageous in the face of difficulty. He encouraged the people under him. He used his God-given wisdom strategically (4:16-22). He stood up against the nobles under him who were using their power for their own ends. He led by example lending to the commoners and not charging any interest. He didn’t take advantage of the fact that he was governor (6:18). 1. Asking the king for leave to go to Jerusalem (Neh 2) 2. Examining the wall and beginning work on it (Neh 2) 3. The entire wall was finished in just 52 days! (6:15-16). 4. Corrected many abuses and brought about many reforms. It is not a weakness for us, as guys, to be sensitive. When other people encounter trials or difficulties this should touch our heart and we should reach out in compassion towards them. We shouldn’t have a heart of stone that doesn’t react and is dead towards others. As William Carey once said, “Ask great things from God; attempt great things for God”. Nehemiah did this long before Carey. He asked God in prayer for help for Jerusalem. Then he ambitiously pursued his goal, boldly asking the king for help and fearlessly pushing on to build the wall even in the face of great obstacles. It is a good thing for us to make plans for what we want to accomplish in the future. When we do so there are several principles to follow, which we can see from Nehemiah. He first prayed to God about it (1:4-11, 2:4). When he knew God was in it (2:20) he carefully surveyed and planned out what needed to be done (2:11-18). Finally he carried out and didn’t give up even in the face of opposition. 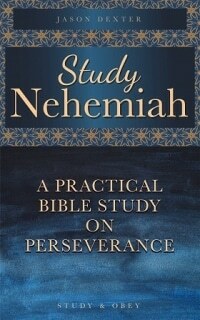 The greatest lesson that we can learn from Nehemiah comes from his amazing endurance. A lot of opposition was mounted, but Nehemiah set his eyes on what was to be accomplished and did not turn aside from that. He knew God was in it and He looked to God for sustenance and strength to carry it through. When obstacles came he didn’t dwell on them, but he submitted them to God’s hands. We need to persevere in what we know is right. We need to focus on what God has for us and not let anything distract us from that. We need to have a zeal to do the Lord’s work. God doesn’t want us to be luke-warm and half-hearted. We need to give our whole heart to serve Him. Nehemiah took a stand against corruption and lax morals for what is right (10:29-39, 13:14-31). We should do the same thing in our schools, in our offices, and in our families. Marrying unbelievers will be a snare to us and cause us to sin. We must not allow ourselves to get even close to that unholy alliance (13:23-30). Throughout the book Nehemiah asks God to repay him for the things he did for God. We should also seek to earn God’s pleasure rather than man’s (13:21, 13:14, 5:19).